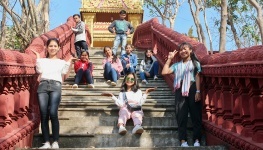 Taramana > News > In Cambodia > Help Taramana’s students! Recently, Philippe and Cécile made a donation to Taramana: a laptop. It was a well-functioning computer but they had no use for it anymore. They decided to give a second life and a second chance to it, our thanks go out to them! After studying the students’ needs, our Social worker decided to offer this laptop to Sophia NHOEM, a student at Western University. Indeed, as part of her studies in both English and Communication, she needs a laptop in order to take notes, do her assignments as well as carry out research on the Web. She is currently in her 3rd year of study and will graduate next year! She wants to become a business women! Taramana is permanently looking for donations: school equipment, toys, clothes, money donation, labour…. We need you! Individuals, small or big companies!